(SD) 1. The year is 1975, where were you, what were you doing and what is one thing you were crazy about from that era? It was in the transition into the Donny and Marie show, I was crazy about my new car; it was a little Chevrolet Chevette. We were just about to begin a whole new career in television. Well 1975 was the beginning of the Donny and Marie show, that’s where the whole thing came out for the first time, “A Little Bit Country, A Little Bit Rock and Roll,” which has kind of become a mantra (Laughs). I started working eighteen hour days, six days a week so my life changed (Laughs). There were so many fun things; I know that Lee Majors from “Six Million Dollar Man,” who had married Farrah Fawcett, was really sought after during that time. Everybody wanted Lee Majors because he was the hot male ticket and I really wanted to meet him, so he agreed to do one of the very first Donny and Marie shows under the terms that we would have his wife come on the show. We asked him what does she do, and he told us she was an actress, so I was quite thrilled to meet Lee Majors but Farrah Fawcett was a Dinosaur saleswoman on our TV show (Laughs). That was the beginning of working with some of the greats. It was really great to get Lee Majors and then from there on we had everybody from Bob Hope, John Wayne, and Groucho Marx to Frank Sinatra. You name it and we worked with them; it was really incredible. (SD) 2. For the first time in 30 years you’ve released a brand new album as a duo. What was the vibe like going back into the studio together and what prompted the decision to reunite? Well I’ll be honest with you, it was a huge challenge (Laughs), because we both have our own separate careers and Buddy Cannon, our producer, had a challenge on his plate to make sure it was a Donny and Marie album, and not just a Donny or Marie album. So, Marie wanted to do certain things, I wanted to do certain things and Buddy was our arbitrator. We were able to come up with a record that all three of us loved which hats off to Buddy for being able to pull that off. Well we had agreed to perform in Vegas together for six months and then we’ve been there now for four years, they’d like us to stay until the end of 2012, actually they’d like us to stay longer but we’ve agreed to 2012. After two years of being there, so many people kept saying, “We love the old stuff, we want you to record together,” so we decided to give it a shot. Getting back into the studio, it was like putting on a pair of old jeans; it was easy (Laughs). There is an interesting blend that we have together, maybe it’s a sibling blend, I don’t know but it was fun and we thoroughly enjoyed it. Our first single debuted at #7 on the country charts, so it was very fulfilling and very nice. I just love our latest single, “The Good Life.” If you listen to the old Donny and Marie, “I’m Leaving It All Up To You” and “Make The World Go Away,” they were like country records for today. It’s nice to have Donny in the studio recording the true and living music which is country (Laughs). (SD) 3. What was the process like for the both of you when it came to choosing the material for the album and did you disagree over any of the selections? Complete disagreement! (Laughs) We’re brother and sister, what are you talking about? What’s interesting is we probably started with about 300 songs that were submitted for this record and it was just a whittling down process. The songs that ended up on the album we obviously all agreed upon. Marie has two solos, I have two solos, and the rest are duets. There are great writers on it and absolutely fabulous songs that we both love to sink our teeth into. What’s interesting is because we were doing our Vegas show at the same time that we were doing that record, we didn’t have time, nor the energy to both go into the studio at the same time and record. Marie has a little studio at her house and I have a studio in my dressing room at the Flamingo here in Las Vegas. That’s how we did our vocals, back and forth. Buddy was in Nashville and he was producing our vocals thousands of miles away from where we were recording, so through technology we were able to get this album done as if we were all in the same room at the same time. The musicians cut the tracks in Nashville. We didn’t have absolutely any time on our plate to be able to fly back there and oversee the process, so we would check in via video conferencing and things like that on Skype. We would be right on top of the project yet do an album a thousand miles apart. That’s how pretty much everything is done nowadays. You could be the most amazing rock band from Ireland and still be recording no matter where you’re from, or be Donny and Marie in Las Vegas at the Flamingo, and have tracks to be done. In fact a couple of albums ago, I was working with Gary Barlow from the band called Take That and we would actually write our material over iChat. I was at home in my studio and he was in England in his studio, and that’s how we did the album. Well we’re as different as the North and South Pole; I’m the North Pole because I like to be where all the gifts are from and Donny, he’s from the South Pole where the wandering Albatross lay their eggs (Laughs). Not really but I tease him all the time and I would say that I was responsible for picking the songs, and he was responsible for titling the album. It took him many months to come up with the title, “Donny & Marie” (Laughs). Buddy Cannon was the producer and he is just fantastic. He’s worked with Kenny Chesney and people like that. We got in there and we had to literally record the album during the same time that we were doing our Flamingo shows, so we’d record all day and then do the show at night. It was crazy and busy but it was a lot of fun. At that same time, I was recording my solo album, “I Can Do This” which is my first inspirational album. I am giving all of the proceeds from the record to the Children’s Miracle Network. I don’t know if you know this, but I am one of the founders of that. So I was really doing two albums and the Flamingo show all at the same time. There is nothing better than getting in the studio and creating music; it’s just a wonderful process. (SD) 4. After years of performing as solo artists and as a duo, what are the advantages and disadvantages of each? The disadvantage is that I have to work with my sister (Laughs). The advantage is that we’ve been working for so long we know exactly how to work with each other. To be honest with you, there are not a lot of disadvantages because over time, Marie and I have been doing this for over forty-eight years now. I was just talking to someone yesterday about this very same thing. What other brother, sister duo out there is there that had their solo careers as well as a duo career? There’s not very many, I can’t think of any. We are fortunate; there are really not a lot of disadvantages because Marie and I can do our own separate solo things, and then come together as a duo; we really have our cake and eat it too. (Laughs), well I could answer this humorously or I could tell you the truth. You know what, there are advantages to both. There’s nothing like recording your own music, of course you know I’ve been blessed to have #1 records like “There’s No Stopping Your Heart,” “Read My Lips,” and “Meet Me In Montana” with Dan Seals which was a CMA Vocal Duo of The Year, and “You’re Still New To Me” which was a duet with Paul Davis. I like doing my own music but I’ve always enjoyed singing with other people. Working with Donny, he’s my sibling and we just know how to do it and get it done; it’s very easy with him. I have to tell you though, when I recorded “Meet Me In Montana,” Dan Seals was part of England Dan and John Ford Coley, so he was used to recording duets and there is a certain way you sing in a duet situation that is very different from singing in a solo situation. Donny is easy to work with, but Dan was probably one of the easiest guys I’ve ever sang with because he was used to singing in a duet situation. (SD) 5. Speaking of going solo, has been the most engaging experience about being able to pursue that avenue? That’s a very unique question Christian, because I’ve always had a solo career. Let’s go back to the beginning; my brother started on the Andy Williams Show and I was a solo artist at 5 years old. Yes, I became part of the group but I always had my solo career. Even when we had “One Bad Apple,” I think it was in 1971, shortly thereafter I had “Go Away Little Girl, “Puppy Love,” “Sweet and Innocent,” so I’ve always had a parallel solo career. Even during the Donny and Marie Show, I was recording and doing things on my own as well. I’ve actually lived so many different careers at the same time in a parallel universe. I remember doing this one particular gig in Las Vegas where I would come out on stage as part of the Osmond Brothers, then I would take over and do a solo set for a few numbers, and then Marie would come out, I’d be part of that, and then my brother Jimmy came out and I did a number with him. So really, I was part of every single act on that show. Well I feel like I’m so blessed, especially being a female in the entertainment business. That’s an interesting question. If I were to say what Marie Osmond is musically, I would say I am country. I love country music, I always have and I always will. I started out recording it when I was twelve and that’s what I love. I have been very blessed to sing many styles of music. If you see the show in Vegas and you hear my album “I Can Do This,” we have original songs that are country, I have songs that are soft pop, to operatic and I do “Ave Verum Corpus” on the album. A good song is a good song no matter what style it’s written in to me. Because of my voice being kind of unique that I can sing so many things from Broadway musicals to whatever, I’ve been blessed to be able to do many, many kinds of music projects, whether it’s being live on Broadway or singing at a Honky Tonk. In the show I do Aerosmith’s “Walk This Way” and Nancy Sinatra’s “These Boots Are Made For Walkin’.” We really do a little bit of country and a little bit of Rock and Roll in our show so therefore I sing both; its fun and I guess that my voice is unique that way so because of that I’ve been able to do a lot of fun things. (SD) 6. Looking back on your career in musical theater, what would you say is most challenging about being on Broadway compared to the concert stage? Consistency; that’s the thing that I learned on Broadway or doing musical theater in general is that it’s so unlike doing a concert because when you do a show that’s a pop concert, rock concert, whatever you want to do, you can actually change the set list, you can open songs up, you can vamp it, you can do whatever you want to do. When you’re doing musical theater, you’ve got a book and the challenge there is that you’ve got to keep it consistent every night despite the fact that you’ve been doing it so many times. I did “Joseph” two thousand times in the course of six years, and that two thousandth show had to be exactly the same as the first because that was the way that Andrew Lloyd Webber wanted it and you become more comfortable in the role after a period of time but you cannot change it. That’s where you’ve got to believe in the material, you’ve got to be consistent and on top of your game because improvising isn’t allowed in certain musical theater venues. It depends on the show obviously. There are some shows where you can break the fourth wall and have a little fun with it but then you’ve to get back into your character. (SD) 7. Who is your favorite country music female artist that you grew up listening to? No question Loretta Lynn. When I first met Loretta, “Paper Roses” had just turned #1 and I went to see her in concert because I loved the fact that she showed women in a positive light. In the 70s, it was pretty much a mans world in music at that time and she showed that you could have children, be married, love your music, be a writer, be a performer, do what you love and you can do it all! I loved her for that; she also has a wicked sense of humor and I love her for that too (Laughs). She came up the hard way and she worked very hard for everything that she had. I think that is why Loretta is still out there making music and touring; its fun and she loves the craft and the art of it and the fans. There are other women I love as well, I mean I love Dolly; I love those strong females that sing to survive but Loretta was definitely the woman that influenced me. (SD) 8. I’d imagine you’re quite proud of your 2009 DWTS “Mirror Ball” trophy. What do you attribute to that amazing victory? Marie’s loss (Laughs). I’m on one today (Laughs). We joke about it all the time, even on stage. There may even be some reference to it in our show that we bring to Chicago. Two words, hard work! (Laughs) Actually two more words, Kym Johnson; she is the most amazing choreographer and friend. She is one of the sweetest ladies on the planet and one of my best friends. Man that woman can crack a whip! (SD) 9. Where do you inherit your terrific sense of humor from and your positive outlook on life? You know my mom had a fun sense of humor and I think having a positive attitude is something you learn, it’s a learned behavior and you just have to choose. You can choose if the glass is half full or half empty, we all go through difficult things but you just have to assess what you learned from it, move on from and find the humor in it. I believe that laughing gets you through anything. It’s like the title of my book, “Might As Well Laugh About It Now,” you know tragedy plus time equals humor so you might as well laugh about it. I’ve actually been quoted in calendars and books and things like that. “Might As Well Laugh About It Now” was also a New York Times best-selling book. I loved Erma Bombeck and it kind of has a little bit I think of an Erma Bombeck type of feel, nobody’s Erma Bombeck of course but I loved how she looked at everyday things, added stories to them and found the humor in life. I guess I am similar in that way, I think (Laughs). (SD) 10. Tell us about your #1 syndicated radio show “The Donny Osmond Radio Show.” How do you manage to make both your radio show and music career work together? It is something that I’ve wanted to do for so many years because radio has been such a huge part of my career, right from the early 70s. I have this vocal booth in my dressing room and as a matter of fact that’s where I did all my vocals for the album. So it’s my own little mini recording studio in my dressing room; I have one at home as well. So at 6:00 every night, I record the show for the following morning and my producer in New York helps me write the script. I can get it done in about an hour. That puts me right to 7:00 and that’s when I start getting ready for the Donny and Marie Show, which goes on at 7:30; it’s clock work. If anything happens we have backups obviously but it’s down to the wire. The reason why we do that is because it’s got to be timely. For instance, when we did Dancing with the Stars which happens on Monday night, Tuesday morning there’s my report and that can only happen if you do it on a timely basis. As a matter of fact, as soon as the results show take place on this season of Dancing with the Stars, during Marie’s segment of the show, I’ll go into my booth and record that break, upload it up to the FTP site, they edit it, produce it, and then put it up on another FTP site where all the stations around the world download it and it’s clockwork. My oldest son has a degree in marketing so he handles all the technical aspects and communication between all the stations and me. He’s really involved in that process; nepotism works sometimes (Laughs). (SD) 11. You sang a most beautiful rendition of “Pie Jesu” on the Oprah show. How did you prepare yourself for that emotional performance both vocally and mentally? You are very sweet! That was probably the hardest thing I’ve ever done. When I started doing the sound of music, Rodgers and Hammerstein organization asked me to do that for them and I had to learn a different way of singing. So I hung up my cowboy boots for a short time (Laughs) and moved to do theater. Doing the Sound Of Music, I learned the form of legit singing and from the legit type of singing I learned that I had a very high soprano voice. During that time of doing The King And I, I studied Opera because I love to keep pushing myself and I love good challenges. When the “I Can Do This” album came up, I told them there were two songs that I’d love to do, “Pie Jesu” which is considered legit soprano and “Ave Verum Corpus,” which I consider more legit opera. It was over that course of ten years that I worked my way into it slowly like that. As for doing it live on Oprah, she wanted me to do it and I told her that I didn’t think I could get through it. Finally after a few weeks of her begging me to do it, I said okay I’ll do it because that song is dedicated to my son on the album. I actually do “Pie Jesu” in the show here in Las Vegas at the Flamingo. (SD) 12. What do you cherish from sharing the stage all those years with your brothers? It’s my life. When you say cherish, it goes beyond cherish. It’s my defining life. That’s what got me where I am today, my brothers. I owe everything to them. They started the Andy Williams Show, I came in later. They taught me how to sing harmonies because they were first at it. My tip of the hat goes to them because they were responsible for getting me where I am today. Andy Williams was a huge part of my life, but how could you not embrace and cherish the memories working with your brothers. (SD) 13. Where did your fascination for dolls come from and what inspired you to create a collection of them through the years? Well I’m the only girl so my mother loved collecting with me; we would collect dolls from all over the world. Dolls to me are just more than dolls, its memories and I tell people to journal the bodies and I have dolls that my grandmother gave me and wrote things on. It’s the art of it, and I sculpt, I design the costumes, and the concept. I think it’s a creative release for me; I just enjoy it so much. (SD) 14. How has the new show in Las Vegas given new perspective to the latest chapter of your careers as a beloved duo? It’s a lot of work. You have to put forth so much effort in putting together a show. We just don’t slap a bunch of songs together, and decorate the stage and say here’s your show. We want people to have an experience and I’d like to think that the reason our show here in Vegas has been going on for so long and has been successful is that when people walk out of the theater they’ve had a great experience. They just didn’t see a show; it was an event for them. We have people coming back three, four and five times to see our show here in Vegas because they enjoy the experience and that’s what Marie and I try to create for our fans. Well we have new fans, especially with the new single, you can definitely tell the people who are coming because they heard the song on the radio, especially younger generations, and we have been working for decades so we are very grateful for that. That is more the exception than the rule. (SD) 15. You and Donny go back and forth between jokes at each other, is this sibling rivalry at its best? Well he’s such an easy target (Laughs), no I’m kidding; it’s probably sibling, I’m sure. I guess we just can’t help it. (SD) 16. What is the atmosphere like being stationed in Las Vegas each week rather then being out on the road on tour; is there any preference out of the two? I love the same pillow (Laughs); it’s my pillow, it’s just the same pillow. It’s really strange because I stay at the Flamingo and I commute back and forth a couple times a week back to my home in Utah. When I walk in my suite here it just feels like home after living here for three and a half years. It’s nice to be able to come back to the same room, the same surroundings and basically your own little dwelling. You don’t wake up in some hotel and wonder what city you’re in. Now granted I miss the touring, that’s why Marie and I wanted to get out there in August and reach the people, because there’s no way that everybody can come to Vegas so the artists have to get out there and work the marketplace. There’s something about hitting the road and getting in those different venues and making it fresh, new and different. It’s a challenge that I absolutely love, I love to do it all, and I love the fact that I can go out and tour solo. Marie and I can tour as a duo, we’ve got Vegas and I have my radio show. I am developing some TV shows right now; I’m working on my 60th album, so there are all kinds of pies that I’ve got my fingers in so life does not get boring. On top of that, the most important thing is I am a father, a husband and a grandpa. For instance, yesterday before I flew to Vegas, I was helping my son install a washing machine. I live such a diverse life, that it is so un-Hollywood (Laughs) but yet I do live it as well. Soon I’ll be flying into Hollywood to work on some development of the TV shows I’m working on, and hopefully by next year it’s going to be on the air. Then other days, I’m out in the garden digging dirt, planting flowers with my wife, and mowing the lawn. I love the fact that I can have that flexibility and I think it’s important. I think that there’s a really lovely element about what I call a good stay at home job. I love being on the road and of course I did that my entire life, but when you have children, I won’t be away from them and so they give up their sports, their friends and things like that. Yeah, they get to travel and all that but it’s been very nice for my younger four children to have that scholastic consistency, their sports and things like that. It’s different when you’re the child on the road that’s doing the working than it is to be a child following your mother who’s doing the working. For my children I like it much better for them to be home and that is why I chose to live here in Vegas. Donny commutes because his wife is at home with his children, but I am a mother so it’s much nicer for me to be at home in Vegas with my children. (SD) 17. What are some of your favorite numbers from the newly revised production? The first one that pops in my mind is an idea that I had a long time ago; I kept thinking how can I involve my brothers into my show without having them here. It would have been logistically impossible so I went back and I picked a song that we had a hit with back in 1973 called “Yo Yo,” and I found this footage from the old Flip Wilson show; all of the brothers were doing this choreography to “Yo Yo.” The four dancers and I, we learned exactly the same choreography. We’ve got this video up on the huge screens behind us and we’re dancing the same way as my brothers and I did like 40 years ago. Right in the middle of it, it shuts down and I say “now we’re gonna break it down” and we go into a hip hop version of “Yo Yo” that a guy by the name of Tony Bruno arranged for me; he does all the arrangements for Rihanna. It goes from this teeny-bopper pop song to this R&B/Hip Hop version of the same song and it’s really, really fast. It wears me out because of the dancing but it’s really cool. Yes, that’s always fun to do; I definitely have favorites for sure. We put in a new opera number; I do a song called “But The World Goes Round” from New York, New York, which is by Kander and Ebb. It is a dance and performance song and its very fun to do every night. Some nights I don’t do it; it just really depends on the audience. I like to shake the show up that way too, we come from the old school of you don’t just do a set show; you do a show that can get your audience. We learned those things from Sammy Davis Jr. and people like that. I remember he would walk offstage and say “Didn’t quite have em’ tonight, we should have done this.” He was always critiquing the show, always critiquing himself, always putting in new material for those people that came back. We have people come back every single year to see our show. Some of them will fly in from Australia, England and all these different countries. It’s crazy and they are so sweet. I believe we’re the only act in Vegas that do meet and greets after the show for our fans and we just changed that up too. It used to be that they would just stand by us and take a picture, but now Donny will go down one side and I’ll go down the other side and then we loop. It gives them extra time with us and I think it’s a much more personable experience at the meet and greet. I like it better; I tend to talk a little bit more than Donny does so it’s fun for me because I can take as long as I want and he can take as long as he wants. The people that come to the meet and greets are so lovely and they are super cute! (SD) 18. What is the greatest piece of advice that your parents taught you about life? Anything worth doing is worth doing well. In other words, if you’re going to do something and you’re going to dedicate some time to it, then be the best. The only way to be the best is to surround yourself with the best. You look at any successful businessman, they’re successful because they surround themselves with smart people and that’s what I’ve tried to do in my career. I have obviously made mistakes along the way, but everybody does, so I would go back to my father’s advice, if anything is worth doing it’s worth doing well. Here again, that applies to what Marie and I are doing in Las Vegas. We are putting forth so much effort in getting the show just right so when people come to see a Donny and Marie, a Donny or Marie show, or Osmond show, they’re going to walk away knowing they just got a great show because we certainly put forth the effort. Well lots of advice, but the thing that I’m most grateful for is that they both taught us to work, that a handshake meant your word and to be ethical. I think that the work ethic that they instilled in me is one of the reasons why I’m still here after forty-eight years of performing. We were never afraid to keep learning and dove in and learned all the workings, whether it was down in the wardrobe department or the music department. When you really understand those things and you’re putting a show together, you know how to budget it, you know how to make it work and you keep learning new skills; so just that veracious desire to work hard and keep learning (Laughs). (SD) 19. You both come from and have respectively large families. How do you balance your family life and hectic schedules of your busy careers? There’s the secret now isn’t it. That’s something you’ve got to be careful of because I have seen so many people as you can well imagine in my years in this business, I see a lot of people lose sight and lose focus of the most important things in life that should be their anchor like their family, spouse and children. This business, I’ve got to tell you is so luring, it can confuse you as to what your priorities should be because it’s a titillating business. The plateaus are never ending. You could keep going and it’s infinity until you become the ultimate entertainer, but then you could fall and then there’s another platform to go to. Really, where are your priorities, what do you want to become in life? I have accomplished so much in my life. There are so many platforms I want to go for the rest of my career but I cannot lose sight of my foundation, and that is my wife, my children, and my grandkids. We have five sons, three of which are married, and three grandkids. You know, that’s the hardest thing, I would say that that’s probably the toughest thing you could ever ask any woman is to work and do all those things. I have to say that my husband is really rocking with that. He is so good about getting up early and taking the kids to school and seminary and doing all the things because I work the night shift now (Laughs). The kids know that and so one of the things that we do when we have our family time, is we try to keep it very sacred to our family time. We try very hard to keep Sundays and Mondays for the kids. We try to go to as many games and performances and things that we can. There is something to be said about good quality time. We’ll have special trips, like sometimes I’ll go to LA or somewhere and I’ll take one of the kids with me, or the two girls or the two boys so we can have good quality time together. My daughter Rachael designs my costumes for me and it has been fun because she grew up with Bob Mackie and Ray Aghayan, who just passed away, and Rhett Turner so she learned a lot. It’s great because in the show in Vegas, the opening outfit is an original Bob Mackie that I wore in 1977 and Rachael reworked it a bit. (SD) 20. Being seasoned artists, what practices and standards do you abide by to maintain continued success in show business? I have been the recipient of a lot of darts thrown at me by shall we say, the hip and cool people in show business because I will not challenge my standards. I won’t do a performance that my children couldn’t watch; I won’t sing a song with lyrics that would embarrass me later on in my life. There has been a lot of opportunity to compromise, but I haven’t gone there because I think it’s a cheap way to get popularity. Well first of all, I feel blessed, I feel like I’m kind of an exception not the rule when it comes to women and I’ve been very fortunate that way. Gratitude is always the best and hard work. Just trying to always push yourself and learn new things, like being invited to play the Grand Ole Opry is the greatest thing. I would also like to play The Met and do an operatic piece at some point because not a lot of people can sing opera and country (Laughs). I would like to always have a goal and always give back to others. I think that’s the other thing, like with Children’s Miracle Network, I think the key to anything is to be grateful and to give back. We’ve raised a little over 4 billion dollars for children and children’s hospitals over the years that I’ve been doing this; those kinds of things make you grateful. The best part of it all is that 100 percent of it goes to the kids. USA Today recently did a poll and out of 124 charities, Children’s Miracle Network came in number 1 so we feel very, very blessed for that. Those are the things that keep my heart moving, just knowing that you can touch people’s lives are the greatest gift you could give. Because you know what, God doesn’t care who we are, he cares what we do with our time down here I think. I feel blessed every night when I go out onstage, hoping that I can touch someone out there in the audience who really needs to be lifted up. 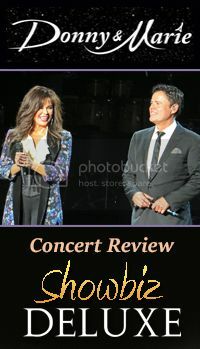 Check out Donny & Marie's brand new video "The Good Life."